AFTER a career in construction that spans 25 years, which took him to Singapore, the Middle East, Hong Kong and the American continent, Son Kuem Chan will be building his first property in Kuala Lumpur. The managing director of Landlovers (M) Sdn Bhd, Son came to Malaysia in 2005. He recalls his initial reconnaissance of the Madge-U-Thant area as he scoured the area for land. “At that time, there was a lot of land to buy and prices were in the RM300 to RM400 psf region. Today, land prices in this area have doubled. Son has a small niche development called 9Madge along Jalan Madge. He will join a host of other developers, both local, Singapore and Korea-based, whose projects are located in the U-Thant and Madge areas. Together with Landlovers on Jalan Madge will be Singapore-based Katana Developments Sdn Bhd (The Katana Residences), Tan & Tan Developments Bhd's (U-Thant Residences) and Singapore-based Dawntree Properties Sdn Bhd (Iringan Hijau), Nam Fatt Bhd (The Gallery @ U-Thant) and other small-scale niche players. The other Korean developer in the area is SsangYong. “We expect more South Koreans to come to Malaysia. Right now, officially there are about 15,000 South Koreans in Malaysia. Unofficially, there may be between 17,000 and 25,000. In the next three to five years, we expect the number to swell to 50,000,” Son says. Rodem Sdn Bhd, a joint venture between Landlovers Group & Hanil Engineering & Construction Co Ltd of Korea, will develop the project. “The attraction here is education. We have many Korean families sending their children here to school. Mothers follow their children here. After a while, the entire family comes over. So from just renting a condominium, some of them eventually end up buying one,” he says. With just 23 units on 0.77 acres, Son is offering a contemporary five-storey, two-block development with two basement car park levels. The building essentially consists of two wings interconnected by a lobby. There will be a central courtyard. One wing will have four and five-bedroom units facing a 25-metre lap pool while the second wing will have two and three-bedroom units. The penthouses will have their own gardens. The size ranges from 1,800 sq ft to 8,200 sq ft. The smaller units will have a minimum of two parking bays while the penthouses, a total of six each. Son says it is essentially a parking bay for every 1,000sq ft. Price ranges from RM2.23mil to RM8mil. The company will use a Singapore architect and will bring in their own project manager from South Korea. For a small project like this, Son says there's a lot of emphasis on quality, both in the public areas like central court, lobby and basement car park and inside the units. “Most basements are dark and lack ventilation. Ours will be different. There will be ample natural light and modern electrical fittings. There will be no network of pipes in the basement, as with most. There will also be proper floor finishes in the basement,” he says. Having checked some of the older developments in the area, Son says 9Madge will have larger units with high ceilings, to bring light and volume to the place. Savills Rahim & Co managing director Robert Ang says most of today's niche developments in the Madge and U-Thant area are moving away from the 1,200sq ft to 2,000 sq ft units. “In the 1980s and 1990s, developers gave five-star location but three-star projects, catering to junior expatriate managers. Today, the situation is different. Even among investors, they are going for quality and larger units, sometimes with a minimum built-up of 3,000sq ft. The demand now is five-star developments in five-star location,” says Ang. There will be a lot of glass in the units themselves and a glass lift and a four-tier security system. The units will have control of the lobby and lift, which means visitors can be guided to the respective units. There will also be a concierge. On the expected growth in the number of South Koreans coming into Malaysia, Ang says after South Korea recovered from the Asian financial crisis in 1997, real estate boomed. “It has a population of about 70 million, and Seoul itself has 10 million or more. Development opportunities are very limited. Because these developers had the financial muscle, they decided to venture out into the region. Malaysia became one of their preferred destinations. Land prices in Singapore were rather prohibitive, likewise education. The South Koreans basically wanted a base in English and so they send their children over. As more of them came over, they decided to buy instead of lease. Another strong pull was Malaysia's golf courses,” says Ang. KUALA LUMPUR: The Golden Triangle and Mont'Kiara continue to remain the top “hot spots” in the Klang Valley for property investments as these areas have shown marked increase in capital appreciation. Property map “guru” Ho Chin Soon said some condominiums in the Kuala Lumpur City Centre (KLCC) development had breached RM2,000psf while the price of condominiums in the affluent Mont'Kiara neighbourhood were also rising. Ho, who is the managing director of Ho Chin Soon Research Sdn Bhd, said the spill over effects from these “hot spots” was apparent but only in certain locations. The Klang Valley, he noted, would remain the No 1 growth region in Malaysia for many years. “Malaysia is an excellent country in Asia to invest in because of excellent infrastructure, solid legislation protecting land rights and liberal policies for foreign investors,” he said in his talk at the Malaysia International Property Showcase yesterday. “We need to fine tune our economic policies to compete with the rest of the world in the light of globalisation. In order to compete we have to change. The recent 12th general election has started the ball rolling. “People voted for change. They want greater transparency. There should no more be negotiated deals or land alienation but tenders and public sale of land,” he added. Ho said there had been a lot of foreign interest in Malaysian property, especially last year when investors from South Korea and the Middle East bought office and condominiums en bloc. He also advised investors to do their “home work” carefully and buy from reputable developers, as there were signs of the market softening. “We have to take what developers tell us with a pinch of salt. Rental yields are going to come down,” he said in response to a question on the many vacant units in Mont'Kiara. From left: Fong, Kumar, Chan, Christopher Hahn of Rahim & Co, Ang, Jagan, FD Iskandar, SP Setia Bhd COO Datuk Voon Tin Yow, Ho, UOB Malaysia CEO Chan Kok Seong, Previndran, The Edge editor-in-chief Ho Kay Tat and The Edge executive editor Au Foong Yee. Real estate investors in Malaysia may be a bit more cautious now, what with the US subprime crisis and the slowdown in the world economy, but the party is still on, according to speakers at The Edge Investment Forum on Real Estate 2008, held at the Eastin Hotel in Petaling Jaya on May 10. More than 500 people attended the forum, which was into its second year, to listen to the views of experts in the industry. Entitled "What's hot; what's not", the forum opened with Previndran Singhe, CEO of Zerin Properties, giving his predictions for the Malaysian property market, and whether it was time to exit it. According to him, Malaysia's property market has another three years of positive growth, albeit slower. Good quality products in good locations will still see rapid growth, he says, adding that where pricing is concerned, Malaysia is far from overpriced. The forum also addressed the issue of whether to invest in commercial properties or residential properties. This paper was presented by the regional president of Fiabci (International Real Estate Federation) Asia-Pacific, Kumar Tharmalingam. He says both investments have their strengths and weaknesses and that on paper, commercial real estate is a better option although landed property is a better investment for the next generation. Kumar also suggests that those who cannot afford to invest on their own should consider partnerships or private equity. Ho cites the constant activity in the Golden Triangle and how parcels of land keep changing hands there. According to him, the Arabs are not the only foreigners who are buying, but the Koreans and Singaporeans have also joined the fray. Robert Ang, managing director of Savills Rahim & Co, whose paper was on buying real estate overseas and its rewards and pitfalls, says investors need to pay close attention to foreign exchange rates and follow conventional wisdom when it comes to observing property cycles. Local knowledge of the country where one is buying is also important, especially changes in official policy, as this would affect one's investments, he adds. The forum also featured a panel discussion on the real estate success story of the Kuala Lumpur City Centre (KLCC). Three developers with projects in KLCC represented by their chiefs, gave an overall analysis of the market in the KLCC. The panellists were Datuk FD Iskandar Mohd Mansor, group managing director of Glomac Bhd; Datuk Jagan Sabapathy, CEO of Bandar Raya Developments Bhd; and Datuk Chan Sau Lai, executive chairman of Beneton Properties Group. The discussion was moderated by Datuk Richard Fong, Glomac's group executive vice-president and president of Fiabci Malaysian chapter. FD Iskandar says Malaysia finally has a focal point in the KLCC, but he feels that the country is not being "sold properly" to attract foreign investment. He suggests that the government place emphasis on making the KLCC an Islamic financial hub, and allow the promotion of the Malaysia My Second Home programme to come under the Prime Minister's Department instead of the Tourism Ministry. Agreeing with FD Iskandar that KLCC has indeed put Malaysia on the world map, Jagan says what's happening with prices in the area is real and not hype. He adds that land is being bought up very quickly there and prices have nowhere to go but up. Chan, whose company is behind Stonor Park, the first high-end condominium in the KLCC, says this is the place to be today. He adds that as land prices escalate, developers will have no choice but to shrink the size of properties on offer. Fong concludes that the KLCC is still hot and that those looking to invest there should do so now. The Edge Investment Forum on Real Estate 2008 was organised by The Edge and presented by United Overseas Bank. The forum was supported by S P Setia Bhd, ranked No 1 in The Edge Top Property Developers Awards for three consecutive years since 2005. KUALA LUMPUR: Loh & Loh Corp Bhd expects its upcoming property development in Selayang to generate RM170mil to RM180mil in gross development value (GDV). That project, which will feature semi-detached and bungalow homes on 34 acres, will take after the construction group’s maiden residential property project in Melawati in Ampang. The Melawati gated-community project, called RiverView Kemensah, comprises 78 semi-detached houses and nine bungalows on 13.44 acres. “We have sold over 90% through word of mouth,” managing director Jason Loh told StarBiz ahead of the launch of RiverView’s showhouses today. Started in October last year and scheduled for completion in October 2009, the development also has a 600m walkway alongside a river flowing through the land. Loh said the company intended to preserve and beautify the river while incorporating it into the overall concept of the development. The showhouses and some of the units were being held back from sale but the launch today would also serve as a branding exercise for Loh & Loh’s future property forays, he added. So far, the RiverView home buyers comprise professionals and businessmen. “There are also a number of upgraders who have lived in the Melawati area for years and are reluctant to move away,” Loh said, adding that the homes were being constructed with families in mind. “One of the things learnt (from the RiverView project) is that we have to be focused on a concept and make it liveable,” said Loh. Feeling that quality had to be emphasised, Loh said there would be demand for good quality homes if the concept was right. On future residential jobs, Loh said the group was now on the lookout for more land. It is working on a formula whereby it would buy a small piece of land but one that would enable the group to achieve a quick turnaround and hedge against the cyclical nature of the construction industry. Apart from being a hedge, property development is a lucrative new business for Loh & Loh. The group recorded revenue of RM290.3mil for its financial year ended Dec 31 and, with RiverView booking in sales of RM110mil and the Selayang project a little more. For many more years to come, the Klang Valley is likely to remain the country's top growth area despite the launch of the Iskandar Malaysia blueprint in late 2006 and the unveiling of the Northern Corridor Economic Region blueprint last July, says Ho Chin Soon, master mapmaker and director of Ho Chin Soon Research Sdn Bhd. "Kuala Lumpur's Golden Triangle is the undisputed No 1 hot spot and people are still looking to buy land there. And when developers buy land, they buy into the future, so the optimism is there," he adds. 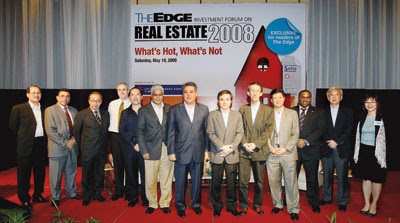 Ho was one of the speakers at the The Edge Investment Forum on Real Estate 2008. He was also a speaker at the inaugural forum held in October last year. Land is scarce in the Kuala Lumpur City Centre and everyone wants to know who owns what, says Ho. His research reveals that some of the prime lots surrounding the KLCC have been transacted. The market is still talking about the record RM2,000 psf that the YTL Group paid for a tract of land in Jalan Stonor, he adds. A residential development is planned for the 0.4ha plot. Many foreigners are also buying land in the KLCC and big funds are looking for properties there because of the subprime crisis in the US and related problems in Europe. "Just last week, a South Korean investor walked into my office and bought a Golden Triangle map. I found out that he had purchased a plot of land near the KLCC for RM1,400 psf," says Ho, who also notes that Suasana Simfoni Sdn Bhd, a company that is partly owned by Singaporeans, has bought two adjoining plots of land for RM172.1 million in Jalan Conlay and plans to develop luxurious residential serviced apartments there. "The Hakka Restaurant in Jalan Kia Peng has also been sold to Fabulous Circuit Sdn Bhd. A lot of people say the plot of land where the Bok House used to be has been sold, but I am unable to find out who the owner is in a title search. The land beside the Pakistan Embassy in Jalan Ampang is also rumoured to have changed hands, but after a check, I found the owner is still Ng Shin Chiu & Sons Rubber Estates Sdn Bhd," says Ho. "The world has changed and economic power has moved from the west to the east. People are saying that it is either you go to Mumbai, Dubai or it's goodbye. Three out of the 10 biggest banks in the world are Chinese banks. Thus, we need to restructure our economy to capture foreign direct investment interest. The people in Malaysia are ready for change. If the politicians are not ready, then let us change the politicians," he adds. During the forum, Ho told the 500 participants that some new developments will be coming up in Kenny Hills in KL because the largest landowner there, Tenaga Nasional Bhd, is inviting tenders for its land. "There are a lot of transactions going on there as Tenaga is selling its land. Why should civil servants or employees of government-linked companies stay in nice bungalows when the prime land is worth millions? Companies such as S P Setia and Sunway Bhd own land there as do private companies. Seven Stars Sdn Bhd own 15 parcels of land in Kenny Hills," he says. Ho adds that the future of property development in the greater Klang Valley or areas out of the second tier (a concept he popularised in his Locational Centre of Gravity theory) would largely belong to Sime Darby Bhd. The Locational Centre of Gravity is centred around Petaling Jaya New Town and areas within a 15km radius of it are deemed to be in the first tier, while locations 25km off are in the second tier. "Last year's Synergy Drive merger between Golden Hope Plantations Bhd, Kumpulan Guthrie Bhd and Sime Darby Bhd resulted in Sime Darby being the developer with the largest landbank in the country. The red colour (refer to map) is the plantation and property development landbank that they own and a large amount is in the second tier. The future action would be Sime Darby's and their land would be ripe for development in 15 to 20 years," Ho says. Asked about the outlook for Cheras in KL and Kajang in Selangor during the question and answer session, Ho says he is optimistic about those two locations. "A lot of developers are making money in Cheras, targeting the upgrader market, and the semidees and bungalows there are quite expensive. While Kajang is just outside the first tier, it is doing well and should have no problem growing further," he adds. There is no denying that the iconic Petronas Twin Towers in the Kuala Lumpur City Centre (KLCC) have served Malaysia well as they have put the country on the world map. The towers have not only created a focal point for the country and the Klang Valley, but also added value to the KLCC area where property prices are concerned. Over the last few years, several high-rise luxury projects have been launched and prices for luxury condominiums in the KLCC today have breached the RM2,000 psf mark. But is there any more upside potential in the KLCC? Or is it all just hype? Three panellists at The Edge Investment Forum on Real Estate 2008, with the theme "What's hot; what's not", addressed these issues when they presented a paper on "A real estate success story — KLCC: A developer's perspective". They were Glomac Bhd's group managing director Datuk FD Iskandar Mohd Mansor, Bandar Raya Developments Bhd's CEO Datuk Jagan Sabapathy and executive chairman of Beneton Properties Group Datuk Chan Sau Lai. Moderated by Datuk Richard Fong, president of the International Real Estate Federation (Fiabci) Malaysian chapter and group executive vice-chairman of Glomac, the panel concurred that the KLCC is far from overpriced. According to FD Iskandar, if one were to compare similar high-end properties in Bangkok, Singapore, Jakarta, Manila and even Ho Chi Minh City, KL's properties are among the cheapest in the region. One of the simplest ways to measure if a city is expensive is to use the Big Mac Index created by The Economist. FD Iskandar points out that Malaysia has one of the cheapest Big Macs in the world, which means the city is "cheap". Jagan feels the same way. "I think the dilemma for most of us is that KL is a cheap city but the KLCC is expensive. People find this difficult to reconcile with. The reality is that the city is a cheap place to live in, do business and invest and I think we're beginning to see the fruits of it," says Jagan. He adds that there is still a lot of domestic liquidity available and although there is a credit crunch in the US and Europe, money is coming in from China, India and the Middle East. "It is common for the Arabs to put money into real estate. All this money has to find a home. The KLCC is an attractive proposition as our interest rates are low." Malaysia's "fairly decent" economic activity and the huge amounts of investment coming in from the oil and gas and telecommunications sectors have also created more high-paying jobs. Jagan sees this as an impetus for the market. Furthermore, the country's improving educational facilities are proving to be attractive to foreigners looking to send their children overseas for education. "These people will be looking to buy quality properties. There is definitely money to buy and rent," says Jagan. Looking at the big picture, he says Malaysia has now become attractive to high net worth Malaysians and global citizens who own several homes all over the world. "KL is the best-kept secret in the entire world, but we do an awful job telling people how good it is. I think it's a conspiracy by the rakyat to keep property prices down!" Jagan was echoing FD Iskandar's point that Malaysia needs to be "rebranded". According to Iskandar, there will always be wealthy people who want the best and are looking for alternatives for their investments. "I believe the KLCC offers the best not only in Malaysia but also in Southeast Asia." One of the steps that can be taken by the government to attract foreign investors is to market and position KL as an international Islamic financial hub, says FD Iskandar. "We need to focus our efforts on making KL the preferred destination to attract global investors, issuers and high net worth individuals to take advantage of their surplus private and sovereign funds." FD Iskandar feels that the Malaysia My Second Home programme needs to be marketed better and that this should fall under the purview of the Prime Minister's Department to ensure more efficiency, speedier approvals and seamless inter-ministerial coordination. The panel also discussed the scarcity of land in the KLCC. According to Jagan, locals and foreigners are picking up land very quickly. "Prices can only go one way — up, and that's the reality of it," he says. Undoubtedly, the shortage of land will drive prices higher but Jagan says if one were to compare KLCC's prices on a per plot ratio basis, they are still cheaper than those in other cities in the region. "For example, YTL group's recent land purchase at RM2,000 psf in Jalan Stonor. On a per plot ratio, we're looking at a pricing of RM200 to RM300." Chan, whose company was one of the first players in the KLCC with its Stonor Park project, says it is definitely the place to be today. "It is cool, chic and the place to chill out." He says there are a few key factors for a successful development — location, good design and timing. "In all major capitals of the world, any development adjacent to, or with a view of iconic landmarks, will always succeed." "In the KLCC area, projects with a view of the iconic Twin Towers will have a good chance to succeed," he adds. According to Chan, developers also need not worry if their projects offer good design. "Good designs always sell and at the prices that KLCC properties command these days, they are more than homes. They are a statement of the owner's social standing and the people who live in them," he says. A case in point is Bandar Raya Developments' Troika. The developer bought the land for RM560 psf in 2004 and priced the units at RM1,000 psf when it launched a year later. The market, says Jagan, reacted accordingly. "People thought we were crazy buying land at that price and even crazier when we began selling. But we had a plan and launched Troika in stages. We were not going to compete on pricing but architecture," he adds. The strategy has certainly paid off for Bandar Raya. The Norman Foster-designed Troika today has recorded transactions at RM2,500 psf, with a portfolio of investors from over 20 countries. "There is no hype. What we're seeing is real," says Jagan. The past few years have certainly seen great changes to the KLCC skyline, with property prices moving at a fast clip, says Chan. He feels that as prices continue to escalate, there are two issues to consider. "First, those who want to and can afford to live in the KLCC area will buy irrespective of price. Second, investors who buy for yield or capital gain will have to consider carefully the state of the rental market." According to Chan, as the cost psf of KLCC properties increases, condo sizes need to be smaller in order to achieve the same yields. "Moving forward, for the KLCC's property market to grow, expat rental allowance should increase and investor yield expectation should match that of other major cities. For example, rental yield for Hong Kong property in a prime area is about 2% return per year," he adds. For KL's property market to be on a par with cities such as London, Hong Kong and Singapore, Chan agrees that KL needs to be branded as a financial hub and it has to formulate policies that will allow free movement of capital. "The government should also look at reducing or eliminating stamp duty, waiving the Real Property Gains Tax, placing no limit on the number of transactions and improving the collection of service charges and property maintenance." Fong says the KLCC is still hot and those looking to invest should do so now.